I moved into my house in 1999 and started remodeling. As soon as I got to a point to where it was GREAT, I started on my gardens. The backyard had a chain link fence and bare spots from dogs running. There was a hedge on the west side that went from the middle of the middle of the house to almost the back fence. So, me and my trusty chain saw went to town. Well, turns out there was a fence underneath all that brush. And a gate. That was just the beginning. I transformed my front and backyards into flower and herb gardens. Over half of the backyard was gardens with no weeds. Had several paths and a water fountain. Then, lifting a bag of soil, I hurt my shoulder. From that point, I slowly stopped all the gardening due to the discomfort. This girl was very bored with nothing to do but work. That’s when I was handed a paint brush by a friend and the artistic abilities that had been hidden for years just popped out. That was in 2010. But, the shoulder was still an issue and, after 2 years of pain, I succumbed to rotator cuff surgery. Six months later, I’m back in the studio painting and LOVING it. What happened to the gardens, you ask? I’ve ripped most of them out since the weeds took over. There are still a few perennials that I allowed to stay, but not many. I tried to go work in the gardens, but all I could think about was what I could be painting on. 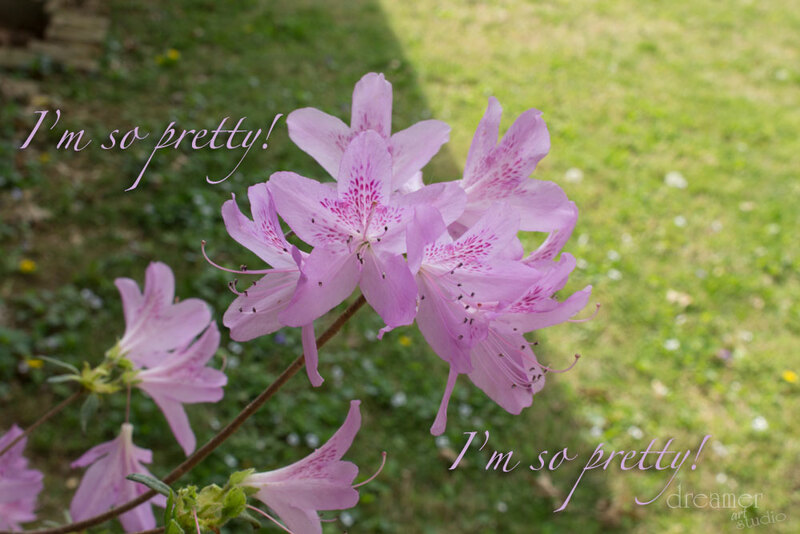 The picture you see here is an Azalea that blooms every spring and it’s right under my bedroom window. I really wish it had a scent, but not. Love the colors, don’t you?